Breed-Specific Inherited Dog Diseases: Breeding To Improve! Which Breeds Suffer From Which Diseases? What's The Solution To Inherited Dog Diseases? How To DNA Test a Dog? Most dog hereditary conditions are minor and cause very little trouble to the dogs victim of these. However, many inherited medical conditions happen to be extremely painful and life-threatening. This is why all dog breeders should work towards reducing those risks by understanding the genetics behind dog breeding and set themselves healthy dog breeding as the main goal. What makes everybody’s task more complicated is that, unlike what we do for human beings, dogs do not have a central medical record that could help fighting these commonly inherited genetic conditions. Every animal has genetic conditions and these will affect more and more specimen if the genetic pool decreases in diversity: this is exactly what is currently happening for dogs and it has started when purebred dogs appeared and became the standard. Pedigree dog breeding rules and showing standards mean that dogs within a breed have been genetically separated from the rest of the canine species over many generations: German Shepherds Dogs should be bred to German Shepherd Dogs according to the official Kennel Club’s ruling. As a result, not only the positive features develop, but also the genetically inherited diseases. Each dog breed started by, what we call, dog inbreeding, which is the mating of close relatives in order to fix traits and characteristics we want from this particular new breed. This is what causes many problems as after decades, medical conditions are appeared in more and more dogs, that we kept breeding together to respect the standards and official register our dogs, which has given a huge boost to these negative genetic traits, called inherited diseases. Unfortunately, nobody has exact statistics and analytics about the number of dogs of different breeds suffering from every disease. Several websites may help you know which medical conditions, inherited or not, should be closely monitored and regularly checked. Their database contains an up-to-date guide to diseases and medical conditions of purebred dogs which are likely to be transmitted wholly or partly through genetic mechanisms. The Inherited Diseases in Dogs Database is compiled by David Sargan. Clear and simple information about the genetic health problems associated with a particular dog breed. The website is full of knowledgeable articles and information: a must for all dog breeders and buyers. The Universities Federation for Animal Welfare is offering a breed-by-breed list of common genetic welfare problems found in our favorite companion dogs. Formerly at the Fred Hutchinson Cancer Research Center, the Dog Genome Project develops resources necessary to clone and map canine genes in an effort to utilize dogs as a model system for genetics and cancer research. Happy days! You can find a suitable, clear partner, to breed your dog with and the litter will be improved grandly in terms of genetic soundness. Nothing is perfect, especially within the domain of genetics, but you will improve the breed that way, by eliminating the negative traits from this particular breed’s genetic pool. It literally works the same way other traits have been fixed such as black and tan german shepherds or the small size of chihuahuas. Nature doesn’t differentiate good and bad characteristics so it goes through the same process and lucky for us, we understand how it works: it is every breeder’s duty to breed clear dogs only. Some traits can be carried by a specimen but not expressed: they are called recessive traits. In diseases associated with recessive genes, both parents—although disease free themselves—carry one normal gene and one recessive gene. Mathematically, each puppy has one chance in four of inheriting two recessive genes and developing the disorder, one chance in four of inheriting two normal genes, and two chances in four of being a carrier like both of the parents and being able to transmit the disease to their own puppies. Ideally, the breeding of dogs carrying recessive negative traits should be avoided to be cautious. Realistically, some breeders will go ahead and breed these dogs if they offer incredible positive traits and characteristics. If you do breed such a dog, you have to make sure that the partner is compatible and clear of the condition your dog is a carrier of. Remember that the next generation should be an improvement. This is a red light: you should not breed this dog. As sad as it can be, you should not breed such a dog, under no circumstances. The reason is simple, the dog will 100% of the time pass on the disease to the next litter, hence, spread the hereditary condition to its filiation. This is exactly what ethical breeders want to avoid the the breed’s sake. Because a dog should not be bred does not mean you should savagely get rid of the dog. Please don’t. Don’t be one of these irresponsible dog breeders. It is still a forever companion needing love and care, every day of its life. Perhaps find him a suitable home, or participate in minor dog shows and competitions to build your reputation, etc. Call your veterinary practice to check if they are themselves able to collect the DNA sample and deal with their laboratory. If so, it is the best option as it is handled by professionals and assures you of accurate data and results. Discuss the results with your vet to come to one of the three conclusions mentioned above. Always ask for official DNA results/reports so you can show them to your future puppy buyers and to anyone doubting or questioning your dog’s genetic soundness. If your vet is unable to perform those DNA checks, find another vet able to do it in your neighborhood, or use a DNA kit. The kit is not a good idea as you are not a specialist and if you get it wrong, the results will be inaccurate. 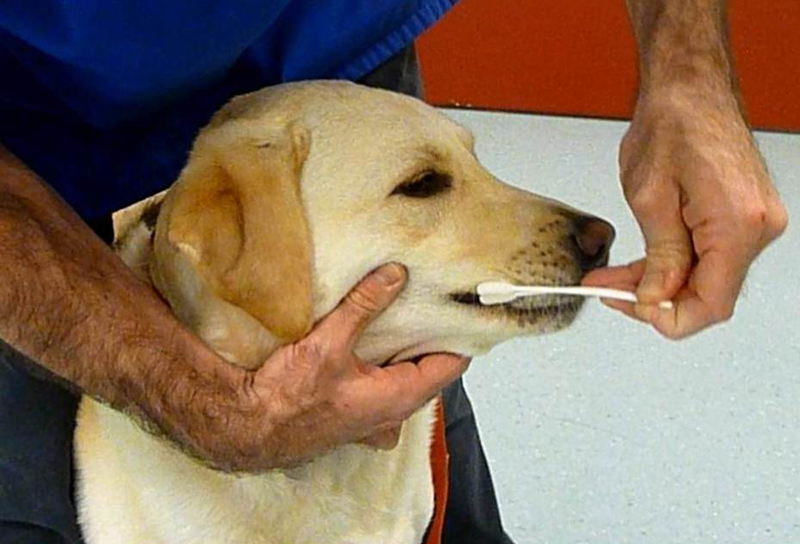 Swab taken from a dog for a DNA screening. The Animal Health Trust was one of the first laboratories in the world to offer DNA testing to dog breeders. Their first test, the rcd1 progressive retinal atrophy in Irish Setters, was introduced in 1995. Their scientists working in the Kennel Club Genetics Centre at the Animal Health Trust work hard to understand the mutation of genes responsible for hereditary diseases and develop the DNA screenings for most of them. Honestly, I don’t like any hereditary diseases, and I believe you don’t like it too. However, we cannot blame anyone if they inherit any disease, especially when it comes to our pet. That’s why, once we see any sign, we must consult our vet first, than to take a risk to treat them on our own.